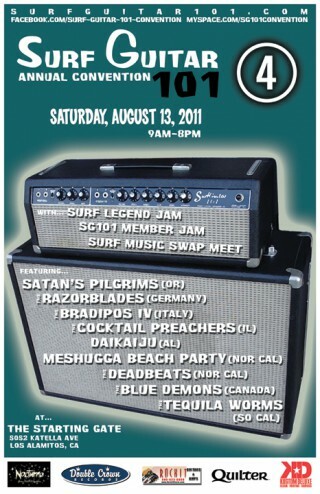 Saturday, August 13 – Surf Guitar 101 Festival in Los Alamitos! Mark your calendars now, Saturday, August 13th 2011 is a date you will not want to miss! Join us for a celebration of live surf music in the heart of Southern California! We are absolutely pleased to announce the headlining act will be none other than Satan’s Pilgrims! We are also excited to continue the tradition started last year by hosting bands from outside the United States. This year, visiting from foreign shores we will have The Razorblades (Germany), The Bradipos IV (Italy), and The Blue Demons (Canada)! As before, we will host a special “Legends of Surf” jam, where members of original 1960’s surf bands will play the classics in the genre. You won’t want to miss this! Past years have featured members of The Belairs, Eddie & The Showmen, The Chantays, The Lively Ones, and The Crossfires. This year we are going to feature the music of The Belairs, Davie “King Fuzz” Allan, and a tribute to Eddie Bertrand! We’ll also have a large vendor space featuring CD’s, vinyl, t-shirts, DVD’s and more! All of this is happening Saturday, August 13th, 2011 at The Starting Gate, 5052 Katella Avenue, in Los Alamitos, California, 9am to 8pm. Tickets will be $25 at the door. Kids 16 & under are free! Satan’s Pilgrims – One of the most popular and influential modern surf bands, these caped musicians hail from the Pacific Northwest, home of the Ventures, The Sonics, and The Wailers. The Razorblades – All the way from Germany, you’ll dig their fast and loud take on surf music. The Bradipos IV – From Italy, you’ll love their traditional surf and spaghetti western sounds. The Cocktail Preachers – This Chicago band indeed preaches to the faithful the sounds of surf, exotica, and Mai-Tais. Daikaiju – This Kabuki masked band hails from Alabama, and plays a high explosive, rocket-fueled progressive form of surf music. One of the most talked about live acts on the scene. Meshugga Beach Party – Who knew? Traditional surf music combined with Jewish folk songs! You have to see to believe these chosen surfers from Northern California. The Deadbeats – One of the hottest and youngest surf bands today, these kids like to play old school surf music loud and fast! The Blue Demons – From Toronto, these wrestling super heroes will take you to the mat with their pile-driving take on surf and garage music. The Tequila Worms – Another young band, these guys hail from Anaheim, California, and sound like The Ventures after getting in a car crash with Link Wray! 8/10: The Sixth Annual Surf Guitar 101 Convention! Tiki Oasis 2011 features a South of the Border theme! Friday August 5 – legendary album cover artist Lou Beach at La Luz!